If you enjoy mitered knitting but want a different look for your next mitered project, try this scarf. It uses both DK-weight and 4-ply weight yarns knit on 5mm needles, to achieve a light and lacy effect. The knitting will look a bit crumpled and lifeless when it's finished, but it develops a wonderful drape and a wicked, pointy shape when blocked to within an inch of its life. This quick knit is great for using up stash yarn. Note: Rowanspun DK has recently been discontinued, though it is still available in many online yarn shops. Any DK-weight yarn may be used; suitable substitutes are Rowan Yorkshire Tweed DK, and Jo Sharp Silkroad DK Tweed. Less than 328yds/300m are required. Less than 54yds/50m of each CC yarn is used; if you only want to use one color for the squares, less than one ball of yarn is required. The first half of this scarf is cast on along one long edge, then worked in a chevron pattern, decreasing at each end. Next, the mitered squares in the center of the scarf are worked. Finally, stitched are picked up along the edges of the mitered squares, and between the squares, and the second half is worked in a chevron pattern, increasing at each end. The points at each end of the scarf are sewn together before blocking. 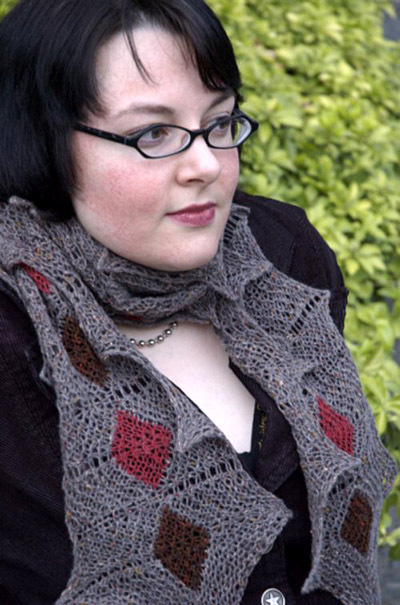 If you wish to make a shorter or longer scarf, subtract or add a multiple of 14 sts. Each 14-st repeat is approx. 3.5 inches long, after blocking. Row 1 [RS]: K2tog, k17, ssk, [k2tog, k4, kfb, kfb, k4, ssk] 22 times, k2tog, k17, ssk. 346 sts. Even-numbered Rows 2-14 [WS]: K all sts. Row 3 [RS]: K2tog, k15, ssk, [k2tog, k4, kfb, kfb, k4, ssk] 22 times, k2tog, k15, ssk. 342 sts. Row 5 [RS]: K2tog, k13, ssk, [k2tog, k4, kfb, kfb, k4, ssk] 22 times, k2tog, k13, ssk. 338 sts. Row 7 [RS]: K2tog, k11, ssk, [k2tog, k4, kfb, kfb, k4, ssk] 22 times, k2tog, k11, ssk. 334 sts. Row 9 [RS]: K2tog, k9, ssk, [k2tog, k4, kfb, kfb, k4, ssk] 22 times, k2tog, k9, ssk. 330 sts. Row 11 [RS]: K2tog, k7, ssk, [k2tog, k4, kfb, kfb, k4, ssk] 22 times, k2tog, k7, ssk. 326 sts. Row 13 [RS]: K2tog, k5, ssk, [k2tog, k4, kfb, kfb, k4, ssk] 22 times, k2tog, k5, ssk. 322 sts. Rows 15 & 16: K all sts. *Row 1 [RS]: Using double-point needle and CC1, k5, ssk, k2tog, k5. 12 sts on right needle. Turn work, leaving rem sts on hold on circular needle; square will be worked back and forth over sts on double-point needle. Even-numbered Rows 2-10 [WS]: K all sts. Row 3 [RS]: K4, ssk, k2tog, k4. 10 sts. Row 5 [RS]: K3, ssk, k2tog, k3. 8 sts. Row 7 [RS]: K2, ssk, k2tog, k2. 6 sts. Row 9 [RS]: K1, ssk, k2tog, k1. 4 sts. Row 11 [RS]: Ssk, k2tog. Place rem 2 sts on hold on safety pin. Repeat from * until all sts on circular needle have been worked. Use CC2 for next square; alternate colors for each following square. There will be 23 squares in total, last square will be worked in CC1. Using MC and circular needle, with RS facing, pick up and k 1 st in edge of last MC garter ridge before first square, [pick up and k 5 sts along first edge of square (1 st in each garter ridge), k 2 held sts, pick up and k 5 sts along rem edge of square, pick up and k 2 sts in MC space between squares] 22 times, pick up and k 5 sts along first edge of last square, k 2 held sts, pick up and k 5 sts along rem edge of last square, pick up and k 1 st in edge of last MC garter ridge of First Half. 322 sts. Odd-numbered Rows 1-13 [WS]: K all sts. Row 2 [RS]: Kfb, k5, kfb, [kfb, k4, ssk, k2tog, k4, kfb] 22 times, kfb, k5, kfb. 326 sts. Row 4 [RS]: Kfb, k7, kfb, [kfb, k4, ssk, k2tog, k4, kfb] 22 times, kfb, k7, kfb. 330 sts. Row 6 [RS]: Kfb, k9, kfb, [kfb, k4, ssk, k2tog, k4, kfb] 22 times, kfb, k9, kfb. 334 sts. Row 8 [RS]: Kfb, k11, kfb, [kfb, k4, ssk, k2tog, k4, kfb] 22 times, kfb, k11, kfb. 338 sts. Row 10 [RS]: Kfb, k13, kfb, [kfb, k4, ssk, k2tog, k4, kfb] 22 times, kfb, k13, kfb. 342 sts. Row 12 [RS]: Kfb, k15, kfb, [kfb, k4, ssk, k2tog, k4, kfb] 22 times, kfb, k15, kfb. 346 sts. Row 14 [RS]: Kfb, k17, kfb, [kfb, k4, ssk, k2tog, k4, kfb] 22 times, kfb, k17, kfb. 350 sts. Row 15 [WS]: K all sts. BO very loosely. Using MC, sew First Half and Second Half together at edges, beside first and last squares. Do not pull yarn too tightly while sewing, or it will break during blocking. Weave in ends. Soak scarf thoroughly, then pin out to measurements given. Pin out ends of scarf to length given first, then pin out points, using a ruler to ensure that each section of the scarf is the same width. 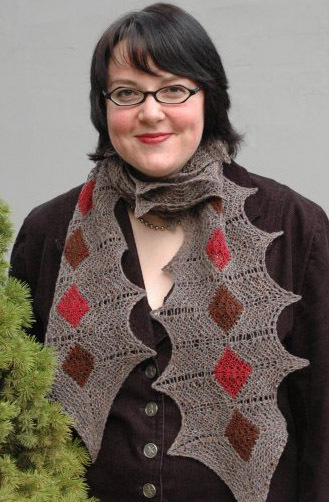 You will have to pull and stretch very hard to make the scarf reach these dimensions; if you haven't blocked lace before, you will likely not have had to do this. Don't worry, the wet wool can take it! You may wish to have a friend help you. (If you desire a shorter, wider scarf, this can easily be achieved by pinning out each section, starting with the middle section, and pinning them out wider than 11 inches.) Pin only the points of each section and the points at each end; do not use additional pins along the edges of the chevrons. (You may wish to use more than one pin in each point; I used two held together.) Pinning at the points only gives the scarf a spiky shape. Allow to dry thoroughly before removing pins. 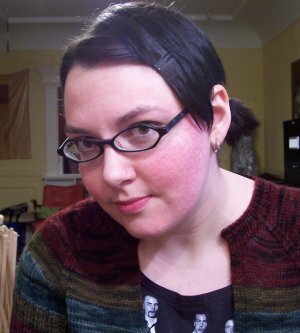 Mandy Moore is an artist and several other things, including Technical Editor editor for Knitty. She is, obviously, not *that* Mandy Moore. She lives in Vancouver, BC, with her husband, cat, and several beloved sweaters. You can find her here.